Courtesy of Phil White and Arik Thormahle, Lake Memphremagog, Vermont. There may not be a busier open water swimmer on the planet. Between coordinating her work schedule with her flights and logistics for her ice swimming and marathon swimming exploits, Jaimie Monahan is a year-round, non-stop whirlwind of activity. 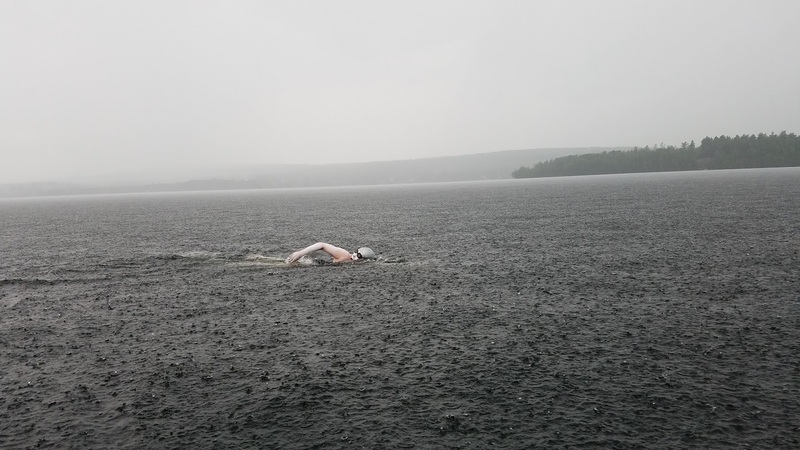 On July 10th, she completed a 25-mile south-to-north, end-to-end, morning-to-night, cross-border marathon swim across Lake Memphremagog between Newport, Vermont and Magog, Canada in 14 hours 18 minutes. Phil White reports, "She left the Newport City Dock at 5:53 am under cloudy skies and arrived in the French-speaking province of Québec as the sun was setting at 8:11 pm. The winds were light, but rain was heavy at times. Fortunately, the slight threat of a thunderstorm never materialized. Water temperature ranged from 70 to 71°F as Arik Thormahle crewed for her aboard a wooden dory. We made the arrangements for pre-authorization of her clearance across the international border into Canada. She has swum in the Memphremagog Winter Swim in 2015 and 2016. This is the first time she has swum in Vermont during the summer." 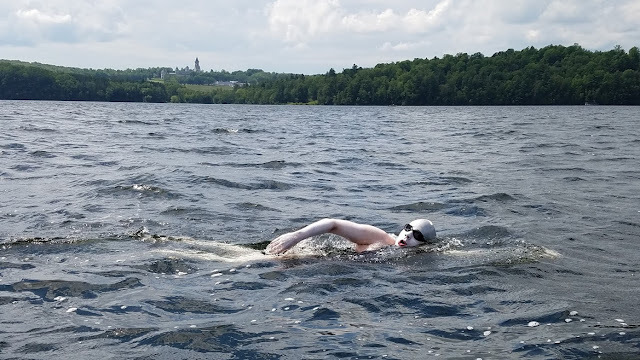 Next up in the cross-border swim in Lake Memphremagog is Charlotte Brynn on July 17th who will be followed by 39 swimmers on the July 29th 25 km Kingdom Swim and 7 additional swimmers who plan to swim the length of the lake in September. "Cooperative Canadian and American border officials have helped facilitate these crossings. We very much appreciate their consideration."